Home >Tools & How To>What is Wood Movement? If you’ve seen an old piece of furniture or woodwork that is split, it could be due to wood movement. It is the number one mistake woodworkers make when working with solid wood. For self-taught woodworkers, this could be a new topic, but even for someone who learned skills from a parent, like me, this may be new information. It’s not intuitive to think that wood moves. It seems strong and stable, and we can’t watch it move in front of our eyes, so it isn’t logical to think that it moves. But it does. And if you don’t consider wood movement in something you’re building or fixing, it could cause issues in the future. Let’s look at this table for example. The top has broken apart and has splits in sections. I picked up this table from a customer who wants the top remade. It gave me a chance to look at this in detail and understand why it is so severely broken. From my experience repairing furniture, it looks like this has been repaired by 2-3 different people over the life of the piece. In each case, the repair made the table top split more. Why? 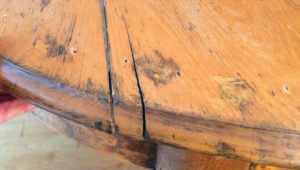 The repairs tried to keep the wood in place by attaching it to the table apron instead of allowing the table top to expand and contract. From what I can tell, the original craftsman built the table correctly, to anticipate wood movement. The table top was attached with brackets that allow the wood to expand and contract. At some point, someone repaired the table and drilled holes through the bottom side of the apron and secured the table top. This would have caused the table top to split. There are also scars on the top where screws were driving in from the top and covered with wood putty. If that wasn’t bad enough, another person drove in 30-40 finishing nails though the top of the table into the table apron. This table top wasn’t going anywhere! The result? When the wood needed to expand and contract, it split. It’s really unfortunate because this was a beautiful table at one point. The apron and legs are very unique. I remember being in woodshop class in the 11th grade and one day there was a gigantic bang sound. It almost sounded like a gun. When the shop teacher looked around for the source of the sound, he quickly focused in on a dining room hutch that one of the senior students was working on. It had been assembled with a large back panel that was made from solid wood. It looked beautiful. Unfortunately the student glued each piece of the back together to make one solid panel, and then glued and nailed it into the back of the cabinet. If this panel was made of plywood, it would have been fine. But this was solid wood, and as the air became dryer, the wood shrank until eventually a 3/4 inch board was torn apart from the pressure. This beautiful cabinet now had a huge visible crack down the back panel. At the time, I didn’t fully understand what happened, but now that I know about wood movement, the story is very clear. Plywood is a dimensionally stable building material, so there isn’t any wood movement. This can make building much easer. You don’t need to think about wood movement. When combined with solid material to conceal the edges, it will look like solid wood to the average person. Plywood also has the advantage of coming in large panels, so this avoids gluing up multiple boards to make up wider panels. If you’re a fan of mid-century modern furniture, you will notice that plywood is often used in that era of furniture. I prefer to use this over solid wood where it makes sense. We hope this gives you a good understanding of how wood moves and why it’s important to allow wood to move in the pieces you build. We’d love to hear your comments and answer any questions you have. Just leave a comment on the video and we’ll get back to you.